In the old school children's tv show Reading Rainbow, the host LeVar Burton would always endorse some great book but then he'd finish with his catch phrase, "But you don't have to take my word for it..." which would usher in various interviews with children reviewing the said literature. 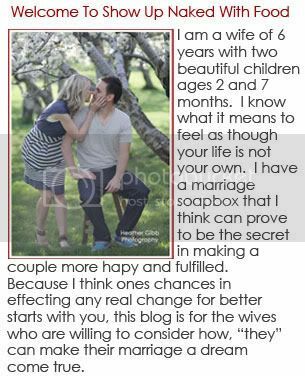 So in the spirit of LeVar- if you'd like to explore what others are saying about being selfless in your marriage... Here are some other great Blogs about "Showing up Naked With Food" in your marriage.